Notes: Stillwater guru, Denny Rickards, developed the Seal Bugger in the mid-1980's at Upper Klamath Lake in Oregon. 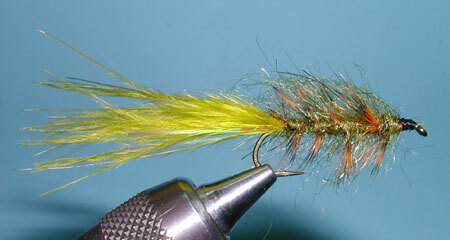 It is a variation of the Woolly Bugger utilizing some of the features of the Mohair Leech patterns. The Seal Bugger is fished as a streamer, usually from a float tube. It is weighted heavily to assist in a deep descent and give the fly a jigging action. Denny will use about 20 wraps of .020 lead-free wire at the forward portion of the hook shank. Angora Goat, a seal substitute, has very good pulsating qualities in the water and is often used as the body material for this fly. It gives a good translucency effect to the fly. Often Lite Brite or Ice Dubbing would be added to the body material for a reflective effect. John Rohmer of Arizona Flyfishing developed a number of color variations with his Simi Seal and this material has proven itself as a great seal substitute material for the Seal Bugger. It's already preblended and is easy to use within a dubbing loop. 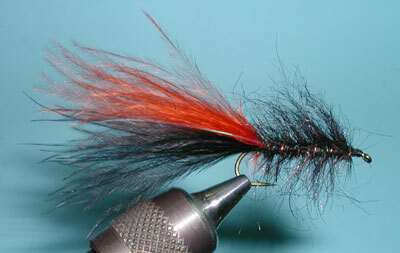 Denny uses dyed Grizzly hackle, often Burnt Orange, Burgundy, and Black, palmered through the body with only 4-5 wraps. He prefers the Nymph Hackle marketed by J. Fair. 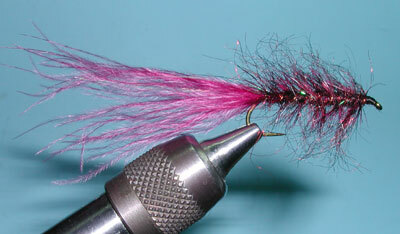 This is a Metz #2 hackle having the proper sizes for the pattern and colors that match the Marabou. 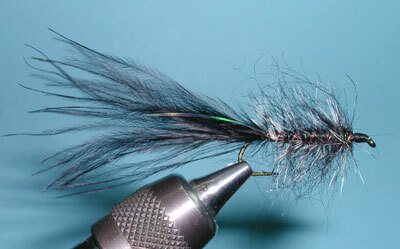 The hackle is brushed well to blend with the body fibers. 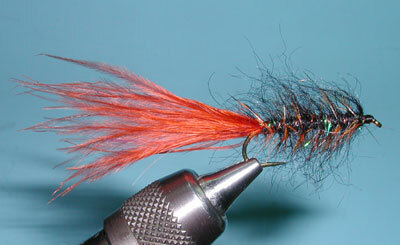 The color contrast provided by the hackle gives this fly some unique attractor properties as well as a segmentation look. The copper wire ribbing is necessary to protect the hackle from unraveling. 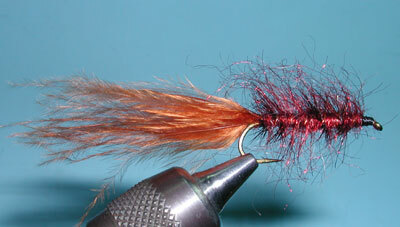 The marabou tail should be sparse with fewer than 20 fibers and somewhat long, about 1.5 times the hook shank. 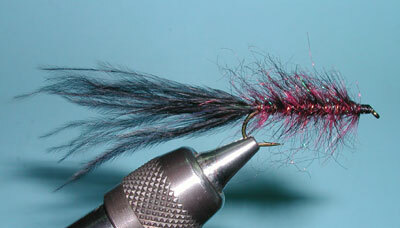 Clip the strands from the quill of a marabou plume so that the strands have a freedom of movement. The sparseness of the material allows the tail to move with a sinulating action. You should select marabou that is fully barbed to the tips. 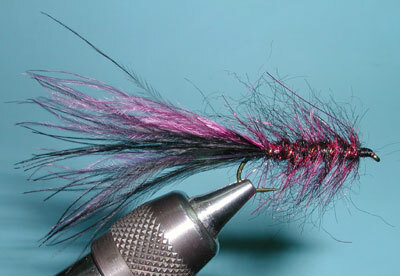 Denny uses many different color combinations of the body, tail and hackle. The major body colors are Olive, Brown, and Black. The darker colors work especially well under low light conditions. The lighter Olive colors work well late-morning and midday. Hackle colorations include: Burnt Orange, Burgundy, Grizzly, and Black. Tail colorations are: Burnt Orange, Burgundy, Olive, Black, Brown, and Dark Olive. Denny has developed some recent variations, particularly by adding two colorations to the tail. Denny prefers to use intermediate sinking lines with most of his stillwater action to give more time to the fly to remain within the strike zone. A clear, translucent line known as "Stillwater" by Scientific Angler is one of his favorites. The sink rate of this line will compensate with a slow retrieve to maintain a uniform depth. Count-downs to reach the proper depth are critical. He is also a strong proponent to fish his seal buggers from a 360 degree exploratory position within the float tube. He prefers this over the more common method of "trolling" the streamer throughout a stillwater. Once the fish have been located, Denny will fish that area through a cast and retrieve method. Count and Retrieve Methods will vary from a long slow pull to short rapid pulls, depending upon the food source the fly is imitating. For instance, as a Leech imitation the Seal Bugger is best retrieved with long, slow pulls, whereas as a baitfish pattern the Seal Bugger should have a short rapid pull.